Quick Links : NEWS ARCHIVE | INSIDE THE FREEMASONS | CHANTREY LODGE 2355 - FIRST PAST THE POST! Yesterday saw Derby Masonic Hall packed to the rafters for the Annual General Meeting of Provincial Grand Lodge. Brethren were welcomed from throughout the Province, along with many visitors and distinguished guests, some who had travelled for many miles. 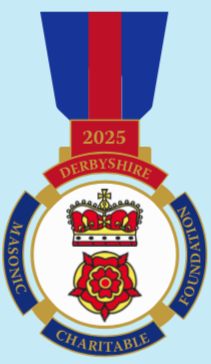 This meeting was particularly special, as the RW Provincial Grand Master Steven Varley officially launched the Derbyshire 2025 Festival. He also received generous donations for the Festival from RW Bro Philip Graham Marshall, the Provincial Grand Master of Nottinghamshire and RW Bro Colin Cantrell, the Provincial Grand Master of the Mark Degree. The RW PGM Steven Varley unveiled the Festival Jewel (pictured below) and shared the news that the festival had already raised £150,000 (10% of the overall target), meaning that we're off to a great start. The new Festival tie was also a great seller with 225 being sold at the event. The Festival team would like to thank all the Brethren for their support of the festival so far and they look forward to your continued support.